As I mentioned, your child is now going to want to be on the move! Therefore, my first suggestion for you, is to find a toy that your little one can begin to push around. Little man had the sit-to-stand walker, and the train. The sit-to-stand walker is what little man preferred to use. I would probably suggest the sit-to-stand walker or the laugh-and-learn walker because of their ease of use. However, I included the train because the back seat disconnects and your little one is able to just push the train. Also, I think the train is a great learning toy that will grow with your child. It is a great tool for teaching letters when the time comes! Now that we’ve got those legs moving, how about the arms?! For this, I suggest a nice set of blocks. Babies LOVE to knock down a tower of blocks! Who doesn’t! However, that is not my only reason for suggesting blocks; Little Man began to stack two blocks somewhere around ten months. Then, right around twelve he was able to stick two of the interlocking (mega) blocks together. Below, I list a few of our favorite block sets! I have actually suggested the Infantio blocks in another post. In my opinion, they are the perfect blocks! I also think it’s awesome that they come with the balls (another awesome toy for motor skills)! The first option of Melissa and Doug blocks is nice because they are soft! The second option is even better because you get two sets, and they focus on a variety of skills (nesting, stacking, letters, numbers, shapes, colors, and animals)! 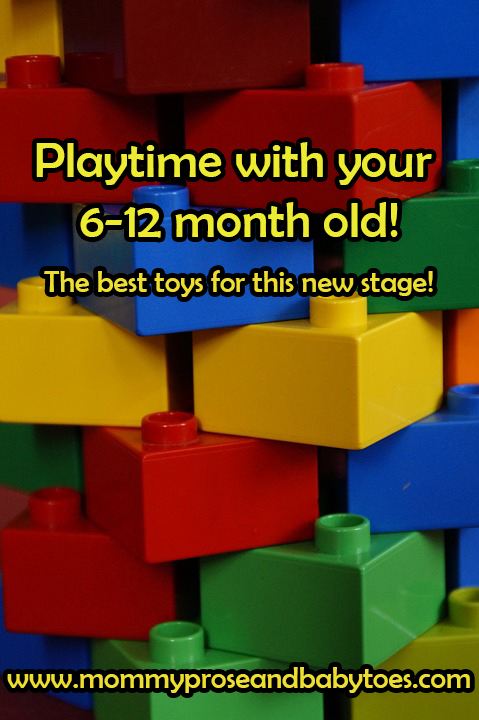 Blocks are great for building cognitive skills as well! Some other great toys that help build cognitive skills at this age are, shape sorters and stacking rings! I was pretty bummed when I went to look at shape sorters and saw that they all had more than three shapes! I think more than three can be a little overwhelming, but if you just focus on one shape at a time, it should be fine. Little Man had my husband’s old Fisher Price one, and it only had three shapes. He learned to put the circle in the correct hole somewhere around ten months. It took longer for the other two shapes. The stacking ring skill came a little later (I can’t remember when exactly), but still before a year. We have the Fisher Price stacking ring set, but I love the other options! I wish I would have seen them when I went shopping! This is the exact music set we have, I like it a lot, but probably a quarter of the instruments needed to be put away until Little Man is older. The ball pit and balls is definitely a larger purchase. However, the pit folds up into a nice little bag, and there is a bag for the balls, so it doesn’t take up too much space. I will say that the ball pit was ten dollars cheaper when I bought it, so maybe keep an eye on the price. Also, I thought the balls were expensive, however, the cheaper versions I found, were either smaller in size or did not say BPA free. Other than what’s above, your baby shouldn’t really need any other toys, and even that can be too much! 🙂 All that really matters is that you take time each day to sit and play with your child. You’ll never get these moments back! Previous Post Caution: Construction Site!